Cloud, Big Data and Mobile: CloudWatch + Lambda Case 2- Keeping watch on AWS ROOT user activity is normal or anomaly ? CloudWatch + Lambda Case 2- Keeping watch on AWS ROOT user activity is normal or anomaly ? As a Best Practice you should never use your AWS root account credentials to access AWS. Instead, create individual (IAM) users for anyone who needs access to your AWS account. This allows you to give each IAM user a unique set of security credentials and grant different permissions to each user. Example: Create an IAM user for yourself as well, give that user administrative privilege, and use that IAM user for all your work and never share your credentials to anyone else. Usually Root has full access and it is not ideal to restrict the same in AWS IAM. Imagine you suddenly doubt some anomaly/suspicious activities done as Root user (using EC2 API’s etc) in your logs other than normal IAM user provisioning; this could be because Root user is compromised or forced, but ultimately it is a deviation from the best practice. In the past we used to poll the CloudTrail logs using programs and differentiate between “root” and “Root”, and our cloud operations used to react to these anomaly behaviors. Now we can inform the cloud operations and customer stake holders near real time using CloudWatch events. 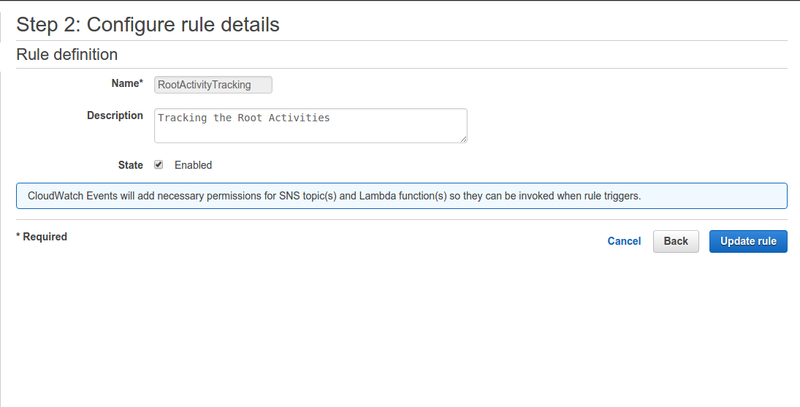 In this use case, Amazon CloudWatch Event will identify activities if any performed by an AWS ROOT user and notifications will be sent to SNS thru AWS Lambda. As a first step, we will be creating a rule in Amazon CloudWatch Events dashboard. We have chosen AWS API Call as an Event to be processed by an AWSCloudTrail Lambda function as a target. 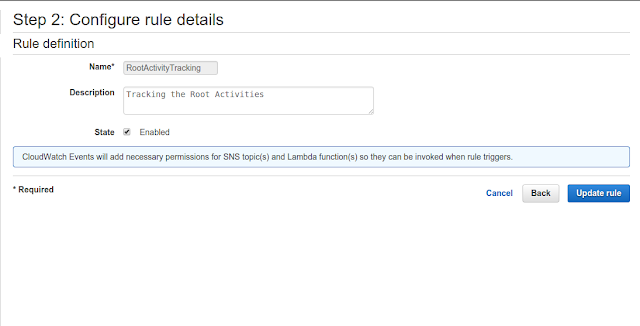 The lambda function will detect if the event is triggered by root user and notifies through SNS.